Upon landing at the airport, one of the main things that you want is to get to your destination safely and quickly. Shuttle buses are the best option as you have the option to choose which central location best suits you and very importantly, it is the most economical way to travel. 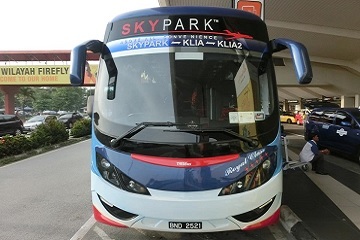 One of the most reliable transportation company is Trans MVS Express which is a well-known Malaysian operator based in Skypark Terminal in Selangor for their shuttle services at the Subang Skypark Terminal, as well as both Kuala Lumpur International Airport (KLIA) and KLIA2. To make your life even less complicated, you can purchase Trans MVS Express bus tickets through a few simple steps using Easybook’s easy-to-navigate website or mobile app that is available to download for free. Travelling within the major airports are especially convenient now with Trans MVS bus made available for you. Besides the airports mentioned, Trans MVS Express have also added KL Sentral into list of their operations so you will be able to travel conveniently into the Klang Valley area and vice versa. You can find departures as early as 5 AM from Subang Skypark Terminal and the service runs hourly until 11 PM with Trans MV bus. The journey can take from an hour to two depending on the Kuala Lumpur traffic, so make sure you purchase the correct bus ticket so you do not miss the check-in time for your flight. 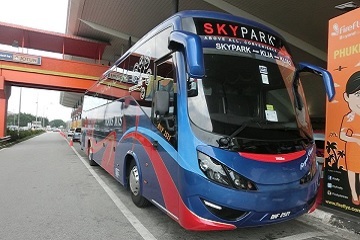 On top of that, Trans MVS Express also offer express bus services that travel to and fro Lukut, Port Dickson and Seremban in Negeri Sembilan; KLIA, KLIA2 and Subang Airport in Selangor to Butterworth in Penang; Alor Setar, Bukit Kayu Hitam, Changloon in Kedah; as well as Danok and Hat Yai in Thailand, just to name a few. Whether you are heading to Hat Yai for some shopping action at the Khlong Hae Floating Market or Port Dickson to hang out on the beach and relax for a few days, Trans MVS bus will be there to kick start the adventure for you. Some of the Trans MVS Express buses are equipped with Wi-Fi service for your convenience to check out the latest news in the world or just to keep in touch with your loved ones. There are also 3-pin plug points supplied onboard to keep your electronic devices charged up for longer use so you can record all the beautiful memories. Have an enjoyable ride as you feel the cool breeze from the air-conditioning system as you sit back and relax at the bus operator's comfortable seats. Easybook is always ready to serve you whether you want to travel from KLIA2 to KL Sentral or from Port Dickson to Hat Yai. You can choose to book your Trans MVS bus ticket online for your next destination with Easybook's mobile app that can be downloaded for free, so it is available literally at the palm of your hand.